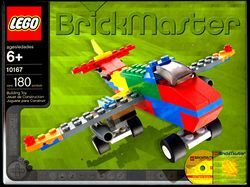 BrickMaster was a LEGO Magazine released every month, until its last issue in 2011, where it was replaced by LEGO Master Builder Academy. It is the same issue of the actual LEGO Magazine except that subscribers don't get it for free and it has some exclusive features, including special articles, contests, and exclusive comics. Each subscription includes six issues and each comes with an exclusive BRICKMASTER set. The first issue shipped includes a LEGO set, two LEGO Shop.com coupons, an admission ticket to LEGOLAND and a Magazine. The sets featured with each magazine belongs to different LEGO Themes, such as Creator, Indiana Jones, BIONICLE, Star Wars, Atlantis, Prince of Persia, etc. This page was last edited on 15 March 2016, at 18:39.